George and Ruth would go on to have a large family – six children in all, four of which they adopted from Korea. George worked for Merck as a chemist for 37 years before he and Ruth decided to retire down south, moving to Hilton Head, SC. But they soon discovered their love for western North Carolina and eventually bought a second home in Blowing Rock. They would spend some time traveling back and forth before deciding to make the Blue Ridge foothills their permanent home. 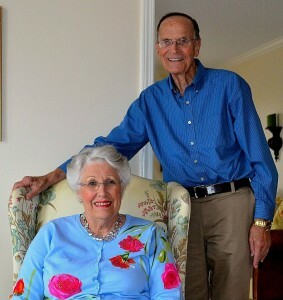 Another milestone they’re looking forward to in the spring will come on April 6, 2015, when George and Ruth celebrate their 60th wedding anniversary.